H ere is a hearty, savory tortilla soup recipe that will make you think you've died and gone to Mexican heaven. 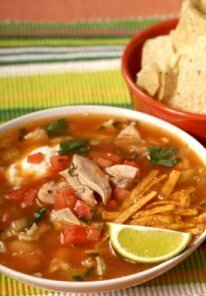 This is my personal favorite version of all the authentic sopa de tortilla or Mexican tortilla soup recipes. It will be best if you make it with a rich home-made chicken stock made from scratch. That's not really hard. Just dump a cut up chicken in a big old pot of boiling water along with a couple stalks of celery (including the leaves), some carrots, green pepper and onion and let it cook until the vegetables are almost mush and the meat is falling off the bones. Remove the chicken and wait until it's cool enough to handle, then pull all the meat off the bones. Strain the rest of the broth through a strainer and toss all the solids. (The veggies have already given up all their flavor anyway). Chill the broth until the fat solidifies on top, peel that off and toss it and you've got great chicken stock for any kind of chicken soup. However, if that sounds like too much work, you can certainly use canned chicken broth in this tortilla soup recipe as many Mexican cooks do today. They, like you, lead busy lives and like to save time when they can. Heat the oil in a large soup pot over medium heat. Add the onion, garlic, jalapeño, cumin and oregano. Cook, stirring frequently, until onion is soft. Add chicken stock, tomato paste, tomatoes, zucchini, shredded chicken, cilantro and lime juice. Bring to a boil, then lower heat to simmer and let cook 30 minutes, stirring occasionally. While the soup simmers, prepare the condiments:Preheat oven to 350 degrees F. Spray a baking sheet with cooking spray, spread tortilla strips in a single layer on sheet and spray again. Bake 5-6 minutes until crisp and lightly browned. Set aside. To serve, place 2-3 tablesppons shredded cheese and 6-8 tortilla strips in each bowl. Ladle in soup, add 3-5 chunks of avocado, sprinkle with a little more cheese and a few tortilla strips and a sprig of cilantro. Optional: Add a small dollop of sour cream before serving.